Orange is a wonderful color … however, it is one of my least favorite. And no offense to any of you who like it, but the orange Premo is just NOT my thing. I like my oranges to have more of a pinkish undertone, more of a jewel-like tone I guess you might call it. 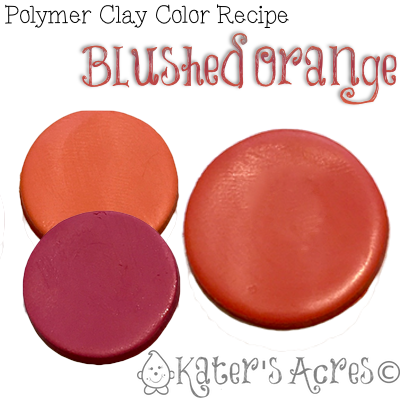 This polymer clay color recipe could NOT be easier. Enjoy! Add 1 more part Premo! Blush for an even deeper pink undertone. Add 1/2 part Premo! antique gold for a nice added shimmer. This orange makes wonderful veins for fall leaves. This orange makes a nice fall pumpkin or jack-o-lantern. This orange color also blends very well with reds and purples. What kinds of things would you make with today’s color? Feel free to post your creations on my Facebook page and show everyone what you have made with the color palette from today’s blog post. Also, feel free to tweet your picture to @katersacres with #KatersCP to show off your creation! I hope today’s color selections help you get back into your studio this weekend! Thanks for joining me today and don’t forget to sign up for more tutorials, prompts, and projects direct to your email. Sign up now.